Futuristic Dreams Turn To Nightmare In 'Electric State' In his latest book, Swedish artist Simon Stålenhag uses his ghostly photorealism to create an alternate America overcome by an addiction to technology, by drought, by war and loss and loneliness. Most of the time, when I read a Simon Stålenhag book, I spend days scanning the trees around my house, looking for a shudder in the leaves; for the hump of a giant robot rising over the treeline, just beginning to stand. Most of the time, I see them everywhere. His books infect me that way. The stories crawl into my brain and mess with my memory of history, time and place. His art (photorealistic, washed out, laced in neon or icicles, nostalgic and futuristic both at the same time) gets into my eyes and stays there. For a while, I can't trust anything. I see his world in the shapes all around me. Stålenhag's two earlier art books (Tales From The Loop and Things From The Flood) exist for me, in a very real way, like an alternate history of a place I've never been, but miss like a second home. They are artifacts recovered from a dream of 1980's and 90's Sweden, of a pastel suburban past littered with robots, spaceships and dinosaur bones. The war had been fought and won by drone pilots — men and women in control rooms far from the battlefields where unmanned machines fought each other in a strategy game played over seven years. The pilots of the federal army had lived a good life in brand-new suburbs where they could choose from thirty kinds of cereal on their way home from work. The drone technology was praised because it spared us meaningless loss of life. The collateral damage was of two kinds: the civilians unfortunate enough to be caught in the crossfire, and the children of the federal pilots who, as a concession to the godheads of defense technology, were all stillborn. That's how State begins. Its first words. Where Tales and Things had an innocence to them — a sense of wildness and freedom in their structure as visual memoirs of a kid growing up in the shadow of a looming, strange future full of inexplicable machines and utopian science gone wrong — State does not. His Swedish books read joyous when they were happy, bittersweet (but rarely sorrowful) when they were not, and adventurous in between. 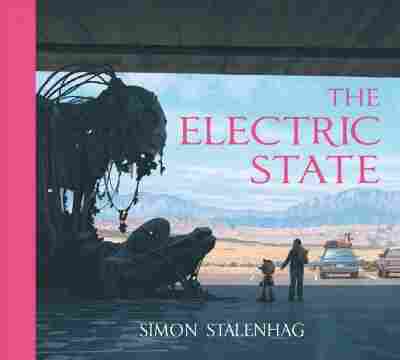 But The Electric State is Stålenhag's American book. His vision of an alternate post-war, post-drought, post-human 1997 in the desert West and California. And it is haunting. The words (so few of them, just the barest few paragraphs every couple of pages) run in two tracks. One is a kind of history lesson on how the United States lost itself to a new VR-style technology called Sentre — initially developed as a way for combat drone pilots to integrate their brains with their machines, "An advanced joystick, basically," the tech later oozing out of the bunkers and defense R&D labs as entertainment; a way for people to check out of the real world for a little while and plug themselves into a global consciousness, play games, pilot giant robots, be born again, all shiny and new. The other track (the larger, the more affecting) is a travelogue of sorts. It's the story of Michelle, a 19-year-old girl with a shotgun, a stolen car and a robot sidekick, trying to make her way across the abandoned, decaying, sandblasted and militarized American west. She's headed for San Francisco, or what remains of it, to a fingerspit of land poking out into the Pacific ocean, and a house there. Because there's something inside that's very important to her, and she has to get it back. Stålenhag's art has always been jarring, with its combination of dull suburban tract houses, Brutalist apartment blocks, boxy economy cars and the sleek lines of pure sci-fi machinery. He's always done decay well, and abandonment. He's always had a hacker's eye for kludging together old technology and new amid a rat's nest of cables and blinky lights. He's got a knack for the slick sheen of biopunk grossness — all tendrils and weird fluids — and the consequent juxtaposition of humans and the machines they have made. ... in his America, in his version of our particular sick and sweaty dream of the future — the man and the machine are one. But State is a departure in that here — in his America, in his version of our particular sick and sweaty dream of the future — the man and the machine are one. The bodies — lost to the deathless convergence of minds inside the beaked "neurocaster" headsets his Sentre junkies wear — are emaciated and skeletal, kept alive by IV drip, then by will, then by nothing but the machine. The giant robots that litter the landscape are cartoony and childish. Or made for war. Or built from scrap and spare parts — shrouded in dangling cables and covered in fingers, like Lovecraftian monsters stalking strip malls and highway rest stops. Michelle tells her story in stages, a few hundred words at a time, recording her impressions of blinding dust storms and convenience stores guarded by assault-rifle-toting teenagers. It unwinds slowly, her past, the reasons for her trip, her relationship with the little, big-headed robot revealed bit by bit. On the opposite track, the history lesson becomes orders given to a mysterious man who's been following Michelle all the way to San Francisco. And when the two storylines cross, they do so in silence. Pictures only. Like snapshots from a horrifying past that never quite was. And if you're anything like me, you'll take those images to bed with you for a long time and dream of Stålenhag's America — lost to sand, to drought, to war, to loneliness, and stalked always by the low, distant rumble of something terrible rising out of the earth and coming for you.